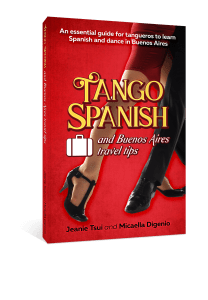 5 Big Questions To Consider Before Going Buenos Aires for Your Tango Classes - Master Spanish Now! Finally you are taking one step further in your tango learning—visiting Buenos Aires, the mecca of tango. You want to learn with the top Argentine masters, get the most out of the trip and come back with shiny skills and techniques—but wait, have you made a plan for your tango classes? Unless you have the luxury of staying in Buenos Aires for months or even years, otherwise the shorter the time you stay, the better the planning you should have made beforehand. I remember 4 years ago in my first visit to Buenos Aires, I didn’t make any plans and just went with the flow. I rushed to the first tango classes I saw. I ended up wasting precious time on classes of wrong level or wrong topics which made me more confused. If I had known better how the tango learning works in Buenos Aires and planned more thoroughly, I would have made a better progress. In this blog post we will first throw you some big questions to consider so to help on your planning. Goal-setting is crucial for achieving a satisfactory result for any learning. It’s also a question that you’d probably be asked the first time when you are taking a private class with any master, so it’s worthwhile to ponder upon this question. Are you trying to become a better milonguero/a so that more people will enjoy dancing with you? Or you are working towards becoming a stage dancer? Or maybe you will be competing in Mundial de Tango (World Tango Dance Tournament) soon? Having a clear goal will be helpful for you to set up a plan for learning, deciding on the master who you’d take classes with, and for your master to understand your needs and work out a suitable plan for training. 2. When will you go? If you are going after the big names, the best time to visit will be July-August when the Mundial de Tango takes place, as many renowned teachers and past champions who are always on tours in foreign countries would come back to be judges in the competition. Another good time would be December-traditional time for family reunion in Argentina when many masters would return from abroad. For the rest of the years there will still be many Argentine teachers around, they may be fabulous dancers and dedicated teachers but less well-known internationally, and are waiting to be discovered in various group classes in the city. The period of time of your stay is another critical factor for deciding the approach of your class-taking. If you are staying only 2-3 weeks, the most efficient way to learn is to take many private classes with one or two masters. However, if you are staying a month or longer, you can afford to spend the first one or two weeks exploring—taking group classes with different masters experiencing their teaching styles and skills, then in the later period focus on your favorite one or two. 4. Do you speak Spanish? Many foreign tango students are shocked to find out almost all group classes in Buenos Aires are conducted in Spanish, even in tango festivals which are mostly attended by foreigners. In fact, it’s natural to expect Argentine teachers teaching in their mother tongue on their native land, and it may also be difficult to find an exact English translation for some Spanish expressions. Some teachers may offer some English explanation, but often less complete than the original Spanish teaching. Before your Buenos Aires trip it’s always a good idea to know some basic Spanish, as it will be crucial for your tango learning, as well as for your daily life and getting along with the locals. However if you don’t have enough time to learn, taking private classes would be more effective for your learning. 5. Are you going solo? Or with a partner? Those who have a dance partner have an edge over the singletons: they have a regular class and practice partner, and can share the cost of private classes as well as other travel costs such as transportation, studio fee, etc. It’s also good to have a company to adapt to a new routine in a foreign city, which can be both exciting and unnerving. However don’t be disheartened if you go by yourself-you may still be able to team up with other singletons you would encounter in group classes, plus there are many solo techniques classes which don’t require a partner. You can also take advantage of the cheaper private class than your own country. Anyway, the trip will be a great occasion for polishing your skills. In our next blog post we will be covering four common ways for people to take tango classes in Buenos Aires. Like our Facebook Page so you won’t miss that (plus you can find loads of FREE resources for learning Spanish for tango! Want more practice? You can book a class with our Tango Spanish teachers who are tangueras living in Buenos Aires!